At the most basic level, workplace diversity is important because it represents fair and equitable hiring practices. It's reflective of society and the truth of our demographics. After all, according to the US Census Bureau, Asian, Hispanic and multiracial groups will hit majority status by 2044. Our businesses need to reflect who we are. But there's another reasons businesses need to focus on building an inclusive workforce: a broad spectrum of talent and ideas is vital for success. Exposure to a variety of points of view can lead to more ideas and better decisions. Diversity pushes us to explore, rethink, innovate and push boundaries. 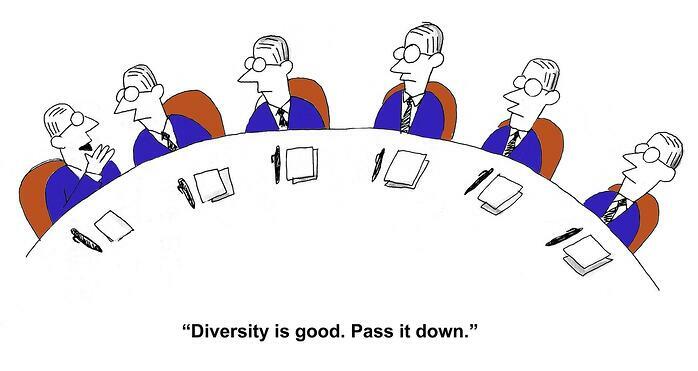 In short, diversity is good for business. We only have to look to The Renaissance for the perfect example. The Age of Enlightenment didn't just take shape out of thin air. It happened because technological advances (larger ships, navigation techniques etc...) enabled people to travel greater distances. When East met West all manner of ideas were exchanged. Creativity was ignited sparking the idea for countless, important innovations. The same holds true for your business. If you're not attracting and retaining women and employees from diverse racial and ethnic backgrounds then you're depriving your company of the full spectrum of available talent. And that is bad for your bottom line. Let's explore 4 practical steps you can take to enhance diversity in the workplace. In order to build an inclusive team you first have to take an honest look at where you are right now. To make any kind of shift, the organization needs to be willing to ask hard questions of itself and try to assess the situation with candor. What mechanisms have you established for offering promotions? How are you managing your talent pipeline? At what point on your corporate ladder are you experiencing the most drop off by women and ethnic minorities? Are you utilizing exit interviews to gather information on drop off? What, if any are you recruitment biases? The best way to find positive solutions is to delve deep into your problems with an honest and unbiased approach. Let's be clear, we are not speaking about quotas or hiring goals. This is about building teams that reflect a wide variety of experience, thinking style, personality type, and points of view. But the truth is if your company culture does not reflect an inclusive mindset, all the quotas in world won't help you to attract the kind of talent you need to succeed. Make certain that your brand aligns with your philosophy. Just as savvy consumers have learned to sniff out green washing, candidates will know when your commitment to diversity is superficial. Hiring managers need to set their checklists aside. Rather than looking for candidates who can check off each box and fit the position profile to a T, look instead for team players who bring a new perspective or unexpected experience. What you want are broad thinkers who bring a spark of innovation to your team. And you're more likely to find that when you cast a wide net. Now devote equal time and energy to getting new hires to stay. According to the 2016 Women in the Workplace Report by McKinsey & Co., women receive less access to the people, feedback and opportunities that lead to promotions. They are also less likely to receive the first critical promotion that will set them on the path to management. And that all adds up to higher attrition rates. This is the time to lay the groundwork for the long run. It’s important to show your hires they have a future in the company. Establish mentoring programs to help build strong relationships and illustrate the pathways for advancement. The Women in Business, Turning Promise into Practice report by Grant Thornton revealed that providing mentors for female employees helps women to build their confidence, empowers them to speak up and to stand up for their ideas. It also provides a framework for seeing where they can go in the company. As Kim Bohr, Executive VP Operations at Fierce, Inc. stated in the HR Daily report on 2017 workplace trends, "An objective within organizations should be to create an environment where all employees can feel at ease and capable of understanding differing perspectives that exist, regardless of gender, race, generation, religious affiliation, or any other aspect of identity." Make certain that avenues for advancement are well known among all of your employees. Create an environment where innovation, flexibility and prudent risks are rewarded. And always highlight successes, both large and small. The confidence and appreciation you extend will be returned two-fold. In addition to focusing on current hires, also think about setting your sights on the future of the workforce. Get involved with organizations that mentor girls and minorities is another way support the diverse workplaces of the future. There are organizations devoted to girls and minorities in STEM fields, in Management and even programs geared toward encouraging girls and minorities to step onto the MBA path. Whatever your field, there's an organization promoting education for kids and job training for under served populations. 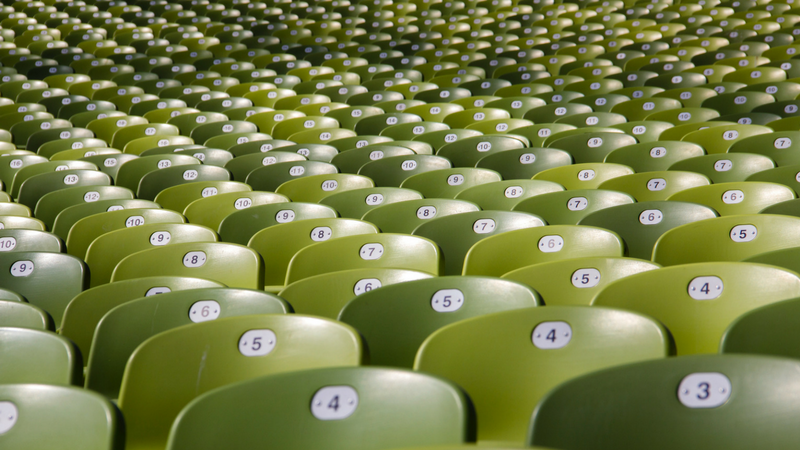 Perhaps the most important thing to remember about diversity, is that it's not just about numbers. It's about a company culture that values equality, and recognizes the inherent strength in a variety of perspectives and ideas. BONUS: For an interesting perspective on how VR is broadening empathy and increasing cooperation across a broad spectrum, read here. What mistakes will cost a hiring manager top talent? What problems might a girl face in the tech field? More and more companies have begun using video conferencing to conduct the early stages of the interview screening process. What begun as a trend, has now become an industry standard, but is this really an effective use of a company’s resources? Let’s explore some of the strengths, weaknesses, opportunities, and threats of video interviews from a cost/benefit perspective. The need for two people to be in the same room is eliminated. Hiring managers and candidates both enjoy greater flexibility, meetings no longer have to be confined to the office, and both parties can meet from the comfort of their own office or home. Handling candidate screening remotely can cut traveling, scheduling, and costs. Money saved can be re-allocated to improving productivity in other sectors of the organization, or towards expansion. Similar to phone interviews, video feed can be one of the most cost effective ways to meet candidates. There’s no better way to get a feel for someone than shaking their hand and sitting across from them. Video can flatten out an interaction, allowing cues you might have picked up in person, to go unseen. When deciding to bring someone into your department, you want to be assured that there’s chemistry and a connection, something you can only fully experience in person. During a face-to-face meeting, candidates are able to get a feel for the environment of the office. Remote meetings cut out the possibility for spontaneous introductions to different team members, while also eliminating the candidate’s opportunity to get a sense of what the office is like. A potential hire's first visit to the office is also one way of seeing if they are a good cultural fit for your organization. Time is money. Instead of budgeting time to get to and from the physical location, all that is necessary is a block of time in front of a computer. Most importantly, video conferencing reduces the time it takes to fill an open position, as you are able to meet more candidates in a shorter period of time. Distance is no longer be an issue for first or second round interviews. You can connect with candidates all over the globe with a touch of a button, allowing you to reach out and discover the hidden potential in unexplored terrains. You don't have to miss out on discovering the final piece to your puzzle because the applicant lives too far away. One of the prime features embedded in a virtual interview is the ability to re-watch or playback the meeting. After a face-to-face meeting, you are left to rely on memory and notes you took during the conversation. Video conferencing allows you to take a second look to analyze body language, or discover cues that might have slipped past you in the moment. You can dig deeper into the candidate's responses, and you can get more team members involved in the decision process. For all of its advantages, technology can sometimes be unreliable. There’s always the possibility for hardware/software problems. Connection is a two way street, so the chances of an interference is doubled, and the wait time can be unpredictable. Lag and delay can both cause interruptions. Hardware problems such as microphone/webcam failures can make communication problematic. With video conferencing you’re buying into the possibility that complications can disrupt an entire interview, setting back your workday. 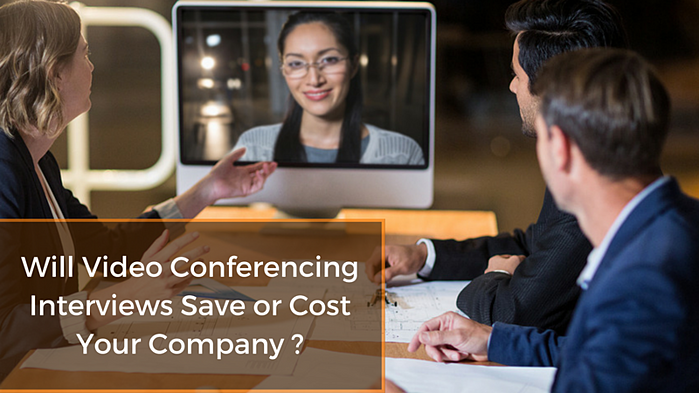 With the benefits of cutting costs and time, it makes sense to switch over to video conferencing for the early stages of the screening process. Here you are happy as can be in your current position when out of the blue you get a call from a recruiter (or a friend drops you a line) saying they've got an amazing opportunity for you. You weren't thinking about leaving - you like your job, your boss is a peach and life is running like clockwork. So you might be tempted to turn down the opportunity to go on the interview, after all, you're busy, why waste anyone's time? Well, there are some great reasons to take the interview, and not all of them center around finding a new job. As they say, the only thing you can count on is change. One day things are running smoothly at work, and the next day you come in to find your company is being acquired. Or maybe your boss gets promoted or leaves and now your team is learning how to work with a new leader. The new boss may not think as highly of you like the old boss, they may have a style that clashes with yours or they may simply have someone else they want to put in your position. You certainly can't plan for this kind of upheaval. On the other end of the spectrum, you never know when you might stumble into the job of your dreams. We've all heard the stories of people who reluctantly went on an interview only to find their dream position. Taking the time to meet for a coffee or lunchtime interview may just be the best thing you can do to maintain control of your destiny. Long gone are the days when a career spanned 25 years and ended with a retirement party and a gold watch. In fact, the new normals for millennials are to spend an average of 2.5 years at any one position. And even if you do find yourself in a long term position, you might be selling yourself short. Chances are incremental raises and promotions will not carry the same kind of bump in $ a new job will (unless of course you are given a counteroffer). Then too is the reality that there's a limit to how far one can climb at the same firm. While your boss may think highly of you, if you are looking to move into a new area or take on responsibilities that greatly vary from your current position, you might just stand a better chance of being thought of in a new light somewhere new. And finally, the truth is, when cuts need to be made some companies will look to cut the costliest employees first. 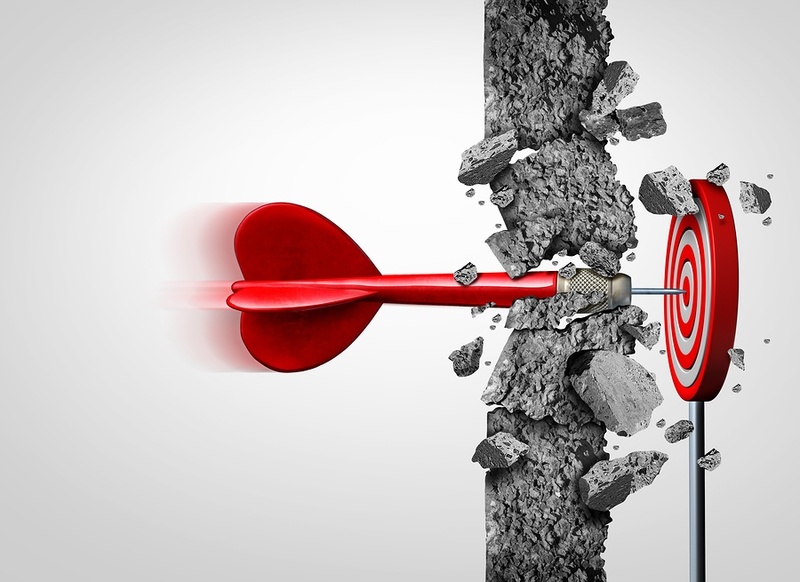 If the choice comes down between someone who is working near the top of the pay grade and a newer hire, chances are you very well might be the first on the chopping block. Just as going on vacation is a great way to re-energize and open new pathways of thinking, so too is talking to other companies. Gaining insight into how other companies operate and other teams engage can act as jet fuel for your current position. While you're certainly not taking these meetings to spy, you can use it as a window into industry trends. Information is power, so even if you're not interested in pursuing the opportunity any further, the worst thing that will come of the interview is insights into market trends. It might also highlight just how good you have it at your present job. You know you should be keeping your resume up to date and your LinkedIn profile current, but if you're not always looking for the next great opportunity, most of us simply won't do it until we need to. But if you wait until you've either left or lost your present position, you're putting yourself at a disadvantage. No one wants to have to do that under duress. There's nothing like getting out in the world to see yourself in a new light. Even if you get nothing else from an interview, it's an opportunity to test how you rate in the marketplace. Afford yourself the chance to test which of your skills are in demand and which you are lacking. You'll be able to see how the marketplace views you and get a better understanding of your strengths and where you need to learn. Any chance to brush up your interview chops is one you should jump at. As long as you remember these few rules, we encourage you to take advantage of every interview that comes your way, you never know where it will lead you! HOW TO KEEP YOUR RESUME UP-TO-DATE: PAIN-FREE! According to The National Center for Women in IT, tech companies with women in management positions achieve a 34% higher return on investment. And yet women still only occupy 26% of the over 4 million computer science-related positions in the country and account for only 11% of executives in Fortune 500 tech companies. The good news is that a good number of organizations and initiatives have cropped up around the country to change the game. Some are focusing on girls still in school, others on offering training to women already out in the workforce. But what unites all of these organizations is the belief that not only should women be occupying an equal share of the over 3 million tech jobs, but that they are in fact the future of tech. Here's a rundown of 10 of the leading not-for-profits and organizations working to forge a path to get more girls in tech, and to help women make their mark in the industry. The US-based program has taught over 40,000 girls to code to date. They offer both after school clubs which are open to 6th-12th-grade girls, and summer immersion programs for 10th-11th-grade girls which take place at leading technology companies. With locations in 42 states, they are driven by the single mandate to close the gender gap in the technology sector. Brook view House in Dorchester, Ma, an organization dedicated to helping homeless families develop life-skills and training has opened their own chapter of #girlswhocode. This kind of outreach to underserved communities is actively changing lives. Not only are they empowering girls who might not have ever thought they were entitled to a career, but they are also laying the very foundation these girls to launch successful careers in tech. Black Girls Code's vision is to: "increase the number of women of color in the digital space by empowering girls of color ages 7 to 17 to become innovators in STEM fields, leaders in their communities, and builders of their own futures through exposure to computer science and technology. To provide African-American youth with the skills to occupy some of the 1.4 million computing job openings expected to be available in the U.S. by 2020, and to train 1 million girls by 2040." And they're succeeding. By reaching out to underrepresented communities to teach coding on platforms such as Ruby on Rails and scratch, Black Girls Code is engaging girls who might never have been introduced to tech in their schools. Through programming and game design they are preparing black girls to not only take their place in the tech sector but to become the designers of their own futures. A not-for-profit organization, Code.org is dedicated to expanding access to computer science to underrepresented populations and girls. They also provide professional learning programs for teachers to integrate CS into their classrooms, are working to set up policies supporting CS and partnering with school districts to add CS to the curriculum. Their Hour Of Code initiative, a free one-hour tutorial designed to provide a fun and easy introduction to coding is available in 45 languages and has been implementing in over 180 countries. Support girls and women’s access to quality education and vocational training. Create employment, revenue generation and professional career opportunities for women. Promote avenues that give women a voice in society, politics and governance institutions. Protect women and girls’ physical and psychological integrity. Case in point is their Girls Can Code initiative in Afghanistan. Working in accordance with the Ministry of Education, they have been able to build the intensive introduction to coding for girls in Kabul. In other words, they are working within cultures to help create a path for women and girls to succeed. Founded in 2008, Geek Girl seeks to empower women & girls (and dudes!) of all ages and all financial levels in technology, from beginner newbie to startup savant." They hold Tech Conferences and workshops, and offer seminars, public speaking training as well as consulting. Geek Girl for Hire is their job initiative aimed at helping women find work. Like these other organizations, Geek Girl is working to help create a more diverse tech workforce and pave the way for a future where education and opportunity are available to everyone. #builtbygirls is one of the organizations leading the way past simply teaching girls to code. As stated on their homepage, they recognize that there are countless opportunities for careers in tech and they've made it their mandate to prepare girls to innovate and lead. Wave Utilizing a devoted mobile platform, this mentorship connects girls 15-18 years old with mentors in the technology sector. Over the course of 9 months, the program pairs each of the 150 girls with 3 mentors, based on the girl's areas of interest. the 3 month period with each mentor is spent in communication in which the 2 will solve a hypothetical problem related to that business or sector. Much of the communication takes place through the app, but the program also includes a monthly visit. At the end of the 3 months, the mentor then introduces their student to 2 relevant contacts from their network - meaning that upon the completion of the program, each student will have a minimum of 9 contacts in her field of interest. The program launched with 150 girls, but has the goal of including 20,000 girls by 202. If they hit their mark, that means those girls will have made over 90,000 connections in the tech sector. Girls Who Fund On the VC/startup end of the business, #builtbygirls offers a summer apprenticeship program for college-bound girls at BBG Ventures, an early-stage seed fund investing in consumer tech startups with at least one female founder. During the month-long program, girls learn the fundamentals of running a startup, study the bones of venture capital (VC). They also are afforded the amazing opportunity to not only meet leaders in the VC field but to also sit in on pitch meetings. The internship concludes with the girls judging the #BUILTBYGIRLSChallenge, a pitch competition for tech products built by girls. What began with one class offered in NYC in 2010 has since blossomed into an organization with chapters in over 56 US cities. GDI provides low-cost training for women to learn web and software development. Their focus is on providing a judgment-free experience where women of all backgrounds and economic levels can learn new skills while increasing their confidence and career prospects. And it seems that they are succeeding, as their organization represents over 55,000 women to date. Founded in Finland, Rails Girls has now blossomed into a global not-for-profit community. Sponsoring events that are organized by volunteers, Rails Girls focuses on providing women with the tools, the knowledge, and the vocabulary to build out their ideas. By making technology more approachable they are empowering a new generation of business owners, entrepreneurs, and content providers. Also born out of a single workshop, this one in San Francisco in 2010, Railsbridge is devoted to creating diversity in tech: not only gender but race, sexual orientation, ability, and class. While their first workshops might have focused on women, they have since expanded their scope. As they say, they "value acceptance, enthusiasm, and hard work. The RailsBridge community thrives on optimism and a love for making great things." Dedicated to education, advocacy, and mentorship, Codechix's aim is to increase the number of women engineers in both industry and academia. And a big part of that mission is to focus on retention. According to their website, 56% of women engineers drop out of the industry within 10 years. One of the best ways to stem that tide is to do exactly what Codechix is doing: fostering opportunities for face-to-face communication, community building, and mentorship. To this end, they "conduct events, participate in competitions as a team, develop open-source projects on our Github repository and actively network to create a foundation for women engineers on the technical ladder in software and hardware." There are countless other initiatives and organizations all working to foster diversity in tech, we'll explore some of the professional organizations in a future blog, and continue to delve into this issue on an ongoing basis. With top talent at a premium in sectors from cyber security to AV/IT, hiring great employees is more challenging than ever. And the last thing any company wants to face is hiring someone who doesn't work out. After all, replacing an employee can cost as much as 6 to 9 months of that employee's annual salary. 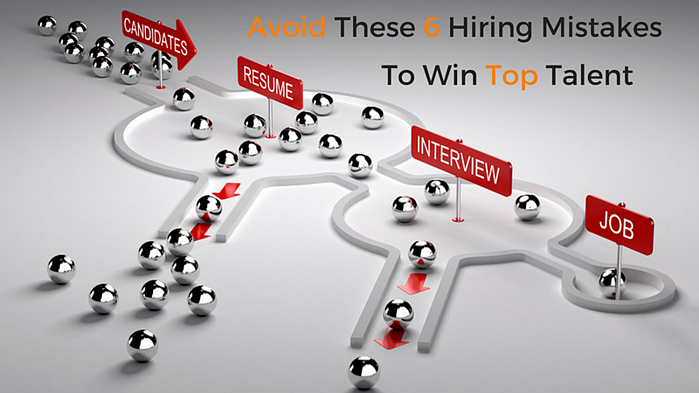 In order to avoid losing both time and money, or even worse not being able to find the right candidate at all, here are 6 hiring mistakes to make certain you avoid. All too often we see hiring managers clinging too tightly to their checklists. Of course there are certain prerequisites of any position, but if you are too set on an ideal you run the very real risk of missing out on a truly great candidate. Or perhaps you are set on the idea of what your team should look like, the hiring equivalent of choosing from a take-out menu: one from column A, two from column B etc... But if you let go of pre-set ideals and consider candidates with diverse backgrounds and unexpected skills, you will enhance the team as a whole. An outsider's perspective can be refreshing and add the kind of new energy and boost you need to move the needle higher. Remember: working with people who are different from us makes us more creative, more diligent and harder-working. It's one thing to know what function you're hiring someone for, but it's another thing to really understanding how the role functions on a day-to-day basis. One of the best tools at your disposal to understand any given role on your team is the exit interview. And while that might sound counterintuitive, it makes perfect sense. After all, what better way to understand what works and what doesn't than to hear from people who are on their way out? Yes, certainly there will be those employees whose opinion you will have to take with a grain of salt, but if you take care to ask the right questions and really listen to the answers you receive, you stand to learn an awful lot about the job you are now faced with filling. So before you go into interviews to fill a role, take the time to talk to the people who have done the job. If you do, you'll not only be able represent the position accurately, but it will also help you look for the candidate best suited to do the job. Every search has its own parameters. Some jobs demand casting a wide net due to location, skill set or competition for talent. Others need to be filled as quickly as possible in order to insure that critical concerns are handled. But no matter the extenuating circumstances your company needs to have an established hiring protocol. While it may seem an obvious system to have in place, too many companies do not have clear hiring policies in place. But taking the time to build a set of protocols not only makes it easier on your hiring managers, it also sends a stronger message to candidates that you are desirable company to work for. In terms of how long you should spend on a search, that will depend on the job you're filling. But take care to never allow the process to go on for too long, otherwise candidates will either lose interest, continue to take meetings at other companies, or decide you are not interested in them and take themselves out of the running. Trying to undercut the competition might look good on paper, but it will not help you to attract top talent. If you're offering compensation that is not in line with your sector you are not only going to be less appealing to candidates, but you're also selling yourself short. The best guideline to follow is a candidate's current compensation package. If you are not able to meet what they are currently making or beat it, adjust the candidates you are considering. Otherwise you'll just be wasting your time as well as the candidates. It's easy to forget that while you're vetting a candidate, they too are interviewing you. They're looking to see if your company supports a culture where they'll feel at ease, supported and can foresee an upward path for themselves. Since more of our time is spent at work than at home with friends and family, the contemporary worker wants to know that they'll be spending their time somewhere they'll feel valued. Just as college recruiters have become marketing machines, pitching students why they're the best choice for their education, you too have to sell candidates on why your position is the one that they should take. What do I have to do to hire the right candidate? How do I do on boarding right? Looking To Hire AV Techs? Make Sure To Look For Talent In These 2 Sectors. Complex AV Systems have become essential to corporations, government, education institutions, transportation, and consumer outlets. Industrywide growth is steady and each year we are seeing the demand deepen. According to the NSCA's State of the Industry report, the majority of market sectors were projecting growth between 15-55% growth for 2016. These trends are borne out in our own practice here at J.Patrick, where we are seeing high demand for talent in all AV roles. See all our jobs listed here. 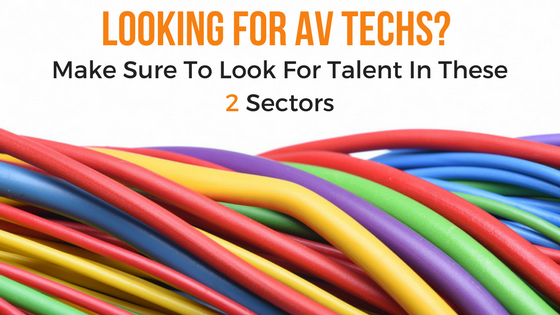 One of the positions we see some of the heaviest demand is for AV Techs. And while candidates entering at this level might not need much prior experience in the field or certifications, the search for talent can still be tough. It's important to keep an open mind when vetting candidates, and considering those who come from parallel industries. 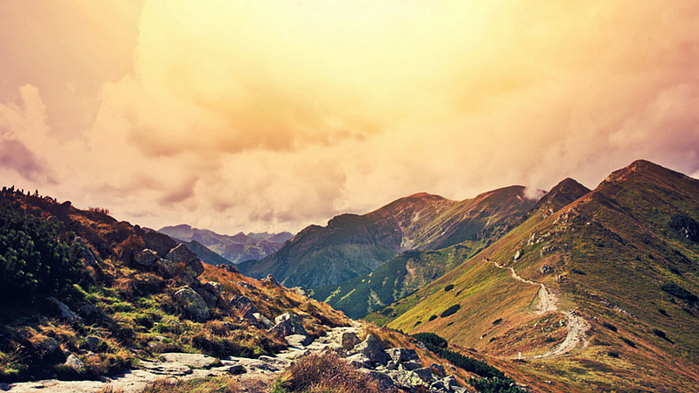 Let's explore a few such parallel industries we've found to be good sources of talent. The music industry is a natural place to search for AV talent as many of the skills and abilities are easily transferable to AV/IT. That the music industry can be a difficult place to make a living and/or to get ahead, makes it an obvious place to recruit for talent. While many people enter the music sector for the passion and the love of music, they also realize they need an industry that can offer them career growth. AV/IT is a natural fit in that regard. We've found that the fact that techs can expect to work in a variety of settings (such as commercial locations, schools, corporations, etc) with technology that is always changing and improving, is very appealing to these kinds of candidates. It's worth noting too that video production is also a good source for talent. Once upon a time security companies simply offered alarm, call, surveillance, and sprinkler systems - the tent poles of basic home/office/institution security. 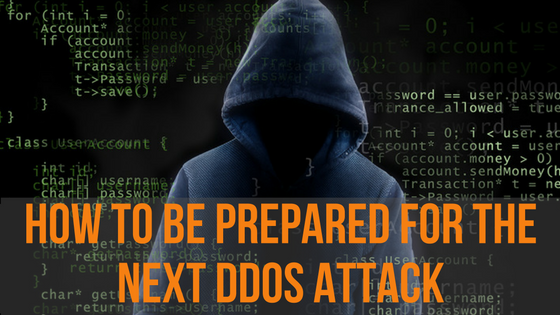 But those days are long gone, and we've seen many traditional security companies expanding their offerings into areas that closely parallel AV/IT. And as a result technicians from this field are well prepared to move into AV/IT. They come with a knowledge of cabling, installation, and the kind of troubleshooting that is required of AV techs. They're well accustomed to working on-site, crawling through walls and under tables in settings that can be sensitive, cramped or in use at the time of installation. They also have a firm understanding of how to work efficiently all while being the face of the company with customers. Just as with other in-demand roles, when it comes to the search for AV Technicians, being willing to set aside your checklist can result in finding the best talent. How To Keep Your Resume Up-To-Date: Pain Free! Remembering to update your resume is just one of those things everyone intends to do, but really, who ever gets around to it? That is until the day when you need it, and you need it fast. So, if you’re like most people, you dust off the old resume, throw your most recent experience in at the top and you get it out the door without a second thought. But while your efforts may have been expedient, they are far from expeditious. You are not showing yourself in the very best light. We know that most recruiters will only spend an average of 6 seconds (6 seconds!!!) looking at your resume. You could be the most qualified person on earth for a position, but if your resume is not up to snuff then you run the very real risk of being overlooked. Let’s run through some simple, easy ideas to help you avoid the last minute rush, and keep your resume up to date so it’s ready when you need it. Think about the things you do on an annual or bi-annual basis. Dental cleaning, spring cleaning, rotating the tires on your car. We have built in reminders for all these chores; the dentist office rarely lets you leave without booking your next appointment in advance, spring has a funny way of making us WANT to clean out the closets, and your mechanic (if they’re worth their salt) will practically insist on rotating the tires at every oil change. 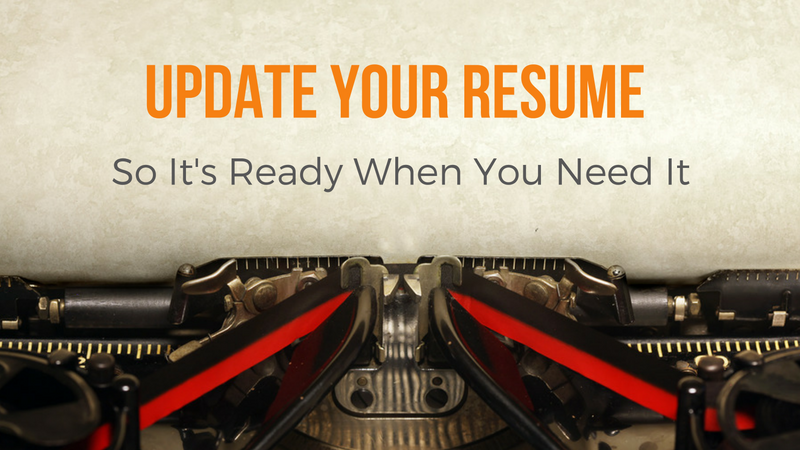 Why not create a built-in reminder to update your resume? My suggestion would be to use something that happens every year, or even better yet, twice a year. Daylight saving time might be the perfect candidate, this way it can become something other than the bane of parents of young children and anyone who dreads losing an hour of sleep every March. So on Sunday, November 6, set a reminder, check the batteries in the smoke alarm and sit down to clean up your resume. When you’re an entry-level professional, it’s common practice to pad your resume with references, club affiliations and college accolades. But once you enter the workforce, all that padding needs to be stripped away. For the first few years you should still maintain a focus on your education, relevant internships and other skills you developed along the way but be certain to keep your most recent experience at the top. 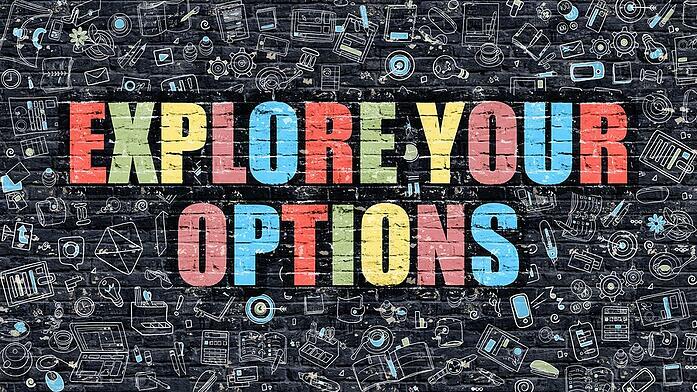 Once you’re further along your career path, your resume must focus on only the most recent 10-15 years of experience. Be certain to edit out any skills, affiliations, college awards and outdated certifications that are no longer relevant. You might be attached to that Certified Novell Engineer cert you worked so hard to earn, but all it will tell potential employers and recruiters is that you are way behind the times. So what exactly does ice cream have to do with your resume? Well, just as all the good stuff is at the top of an ice cream cone, that has to be the case with your resume as well. Devote the majority of real estate to your most recent experience detailing projects, presentations and quotas met or surpassed. It’s here at the top that recruiters and hiring managers want to hear about accomplishments, and read stats from your last quarter. Providing the meat of your abilities (pardon the mixed metaphors) at the top, where the eye is naturally going to go, allows the folks looking you over to get the best snapshot of your current skill level. As you move further away from the present, descriptions and lists of responsibilities become briefer. However, this isn’t the place to generalize. Providing dynamic descriptions of your past positions paints a much richer and fuller picture of you than a rote listing of job titles. When you are updating your resume there’s nothing worse than trying to remember how a specific project went down, or where on earth you filed those stats. In order to avoid a rush job, or trying to weed wack your way through your memory, I’d suggest you maintain a log of ongoing and completed projects, sales or installations. Not only will the information be at your fingertips when you need it, but you are more likely to remember the details better if you’ve kept a chronicle of it in writing. Just as you make it your business to stay current with certifications, training and the most recent trends in your sector because it makes you a better employee and candidate for when you are ready to move up to your next job, keeping your resume up to date is part of career maintenance.